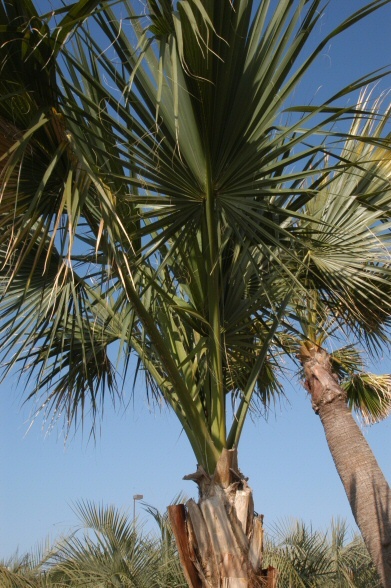 NATURAL HABITAT AND PREFERRED SITE: Texas palm is native to the southern point of Texas and will adapt to landscape sites as far north as the Dallas/Fort Worth area. 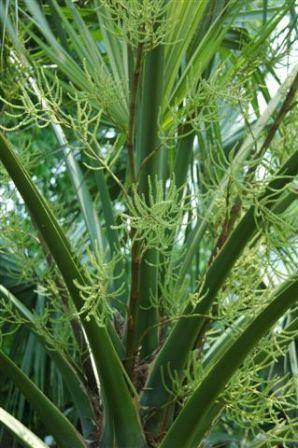 IDENTIFICATION INFORMATION: Texas palm is a small palm tree with large, fan-shaped leaves forming a rounded crown and a single trunk. For 8 to 10 years it grows into a large clump before the trunk starts to appear at the base. 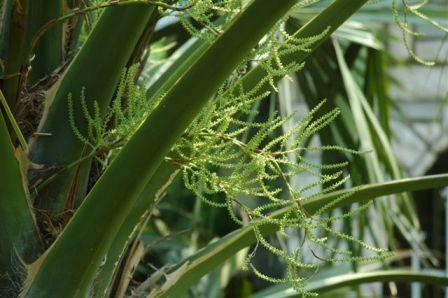 FLOWERS AND FRUIT: Flower stalks are 6 to 8 feet long and drooping clusters. Flowers are small, white, or greenish, fragrant and bloom March to April. Fruits are dull black to dark purple, hang down in showy clusters and are sweet and edible. Seed are dark brown and shiny and one edge is often flattened, rounded, 1 ½ to ¾ inch, purple and hang down in showy clusters and are sweet and edible. Seed are dark brown and shiny and one edge is often flattened. BARK: Reddish brown with prominent leaf scars. Leaf bases cling to the trunk forming a distinctive cross hatched appearance. These will often shed as the tree ages. FOLIAGE: Large dramatic leaves with spineless stems. Leaves up to three feet in diameter, blue-green in color. CULTURE: Slow growing with an enormous root system which makes it rather hard to transplant after the plant is large. Easy to grow in a wide range of soils as far north as the Dallas/Fort Worth area. PROBLEMS: Freeze damage in the far northern part of the state. PROPAGATION: From seed planted immediately after maturity. 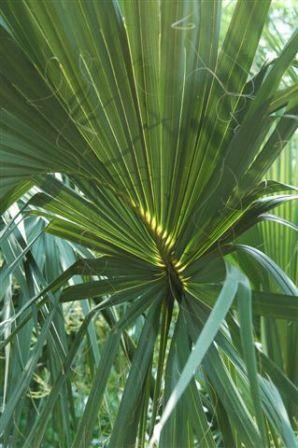 INSIGHT: Texas palm is the only tree-sized palm native to Texas. Several Texas palms were planted in 1936 at the State Fairgrounds in Dallas for the Texas Centennial. They survived until the severe winter of ‘83 and ‘84 killed the plants to the ground. They did return. Almost all of the exotic palms were completely killed during this winter. QUESTION: I have a variety of palms and they took a hard hit with the hard freezes this year. Had the trunks wrapped before the first hard freeze and are still wrapped. When soul they be unwrapped and what about pruning and fertilizer to bring them back? ANSWER: The hardy palms don’t have to be wrapped at all. In your case, I would probably remove the wrapping because it really doesn’t protect the tropical palms anyway. Now is the time to apply organic fertilizer and any of the locally available choices will be fine. Cut the brown leaves off, they are dead and won’t come back. Hopefully your plants aren’t damaged too much. If you have to replant, the choices that didn’t even have cosmetic damage include sabal, pindo, needle, Japanese windmill and Mediterranean palms.